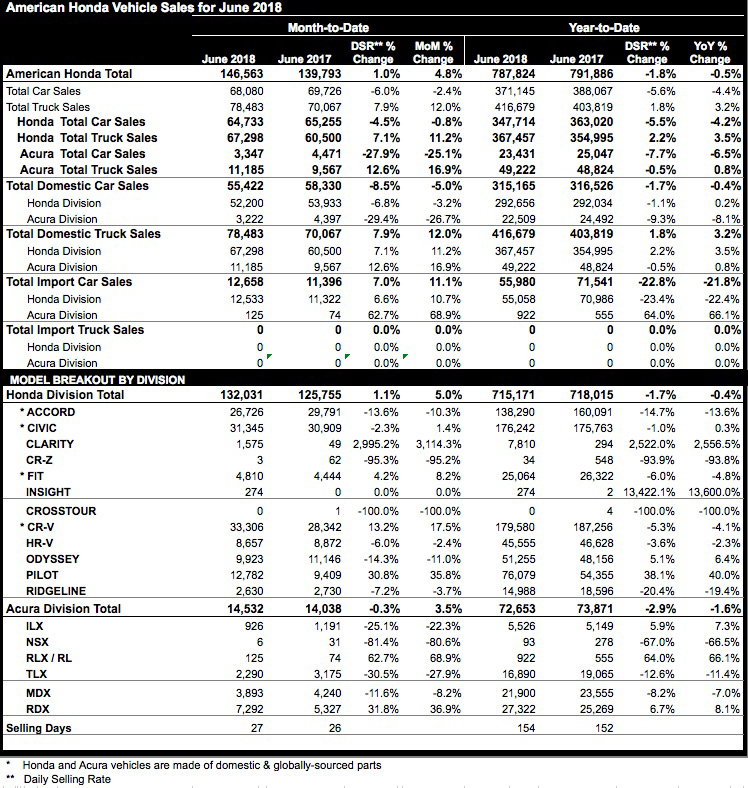 Trucks led gains for Honda in June, with the brand, trucks, CR-V and Pilot all setting new June records. Honda cars also fared well in June, with Civic and Fit up modestly, and Accord topping 26,000 sales for the month. Pilot also set a new June record, jumping 35.8% on sales of 12,782 units, marking the model’s 10th straight monthly increase. With Fit, Civic and Accord, Honda sells more retail cars in the subcompact, compact and midsize segments combined than any other brand in the industry. Odyssey is the clear benchmark people-mover minivan in America and the most purchased among retail buyers. The first in a new generation of Acura products, the 2019 RDX went on-sale in June with more performance, features and luxury than ever before. ILX topped the Small Premium Car segment in the J.D. Power 2018 U.S. Initial Quality Study (IQS), and is gaining share among new entry-luxury buyers in a challenging market.